Does anyone else have a plethora of flies? The air fairly hums with them around here. Apparently they can open the door if they team up, because they’re getting in somewhere. The screens are intact and after a careful search, I’ve found no dead livestock to attract them next to the house. But, each morning I have a fresh crop despite having killed the previous day’s crop off before bedtime. Each morning I spend some quality time with my fly swatter and diminish the herd as much as possible. My theory is that they are slightly slower in the cool morning air. Of course, I am too. When I first get up I’m stiff, have slow reflexes and have to become caffeinated to be at my best. After that first cup of coffee though, I’m ready to kill some flies. The grandboys have been here and like kids of every generation since the invention of the screen door, they do not pass through that portal without pause and will often stand in the door to tell me something. I can hardly hear them over the hum of the fly wings as they come in en masse. Flies don’t seem to concern them as much as me. 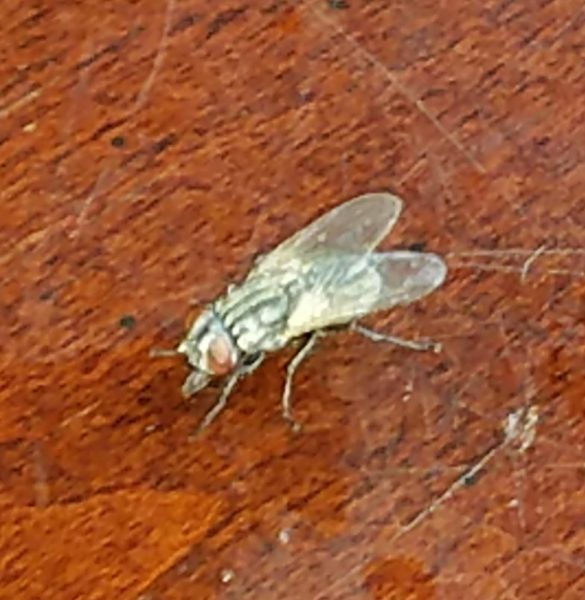 The idea of those dirty little fly feet tromping around on my counters, food, or even better, the rim of my glass or cup, just doesn’t appeal at all. Fly swatting is one of those skills that gets better with practice and I’ve sure been practicing. My kill percentage has increased rapidly until I’ve honed my skills to the point that I think by the end of summer I will be at a level to compete at the World Cup Fly Swat. Killing two flies with one swat is always a bonus point deal and yesterday I even killed two while they were, well, making little flies. The dance I did upon their sudden death was quite energetic. It even involved a little moon walking. It was a big moment. Flies have a short life span and one would think, a short attention span. But, I’m just amazed at how they instinctively know the fly swatter isn’t a friend. One miss and you suddenly have an educated fly. It is wily, deceitful, wary, and fast. It can gauge the impact of the swatter to the very nano second in order to elude the squish. I also suspect an intelligence far beyond what science allows in that they are absolutely accurate predictors of rain. A highly trained meteorologist who is trying to predict the arrival of rain through all of the computer models, weather satellites, and other sophisticated equipment is only occasionally right. Perhaps what they need is a simple window screen. If there are flies on it, it’s going to rain. I did finally break down and buy some fly spray for outdoors. I sprayed around the windows and on the sunny side of the house when the flies were warming their engines on the siding early in the morning. It was just a little too satisfying watching them get wobbly and finally do the death spiral. Good stuff, that fly spray. Supposed to work in barns and dairies. It certainly worked out there. It was nice to not have flies pounding their little fists on the screens and door for a little while. They called in reinforcements though, and I still have flies. So, the war continues. I have a fly swatter in several rooms of the house so that they are readily available at all times. Wait. What’s that? I think I hear them ganging up to open the screen door! Gotta go!